Our Desi Wool cushions and throws are hand woven from local "desi" wool on traditional pit looms in Kutch, Gujarat, an area famed for its weaving. The weavers who create this wool cloth are part of a group of highly skilled artisans in Kutch, who have been encouraged by a local master weaver to stay in their village and pursue their traditional craft. By being paid a fair price for their work, many villagers have chosen to stay and weave, rather than leave the area and their families for work in the cities. The award-winning Vankar Vishram Valji weavers are some of the most respected and accomplished weavers in Kutch. Master weaver Shamji and his family train and employ around 90 weavers on pit looms they built after the earthquake of 2001. The family is committed to preserving local weaving and natural dyeing skills in the region in the face of stiff competition from machine woven cloth, man made fibres and chemical dyestuffs. Desi wool has a distinctive "dry" texture, a little like linen, typical of wool from this area. Because the wool yarn is hand spun, the cloth has a wonderfully irregular texture, full of movement. It is often dyed with natural dyes such as indigo and lac red - Shamji is instrumental in the revival of traditional lac red dyeing in Kutch. The Rabari, an indigenous tribal caste which probably originated in Afghanistan, traditionally led a nomadic life raising sheep, camels and goats, and spinning their wool. They exchanged their hand spun wool for hand woven clothing and blankets. As elsewhere in the world, attitudes in India towards tolerating nomadic groups have changed, and only a small number of Rabari are now truly nomadic. However, one can still see them moving through the arid desert region of Kutch, carrying their tented homes with them. 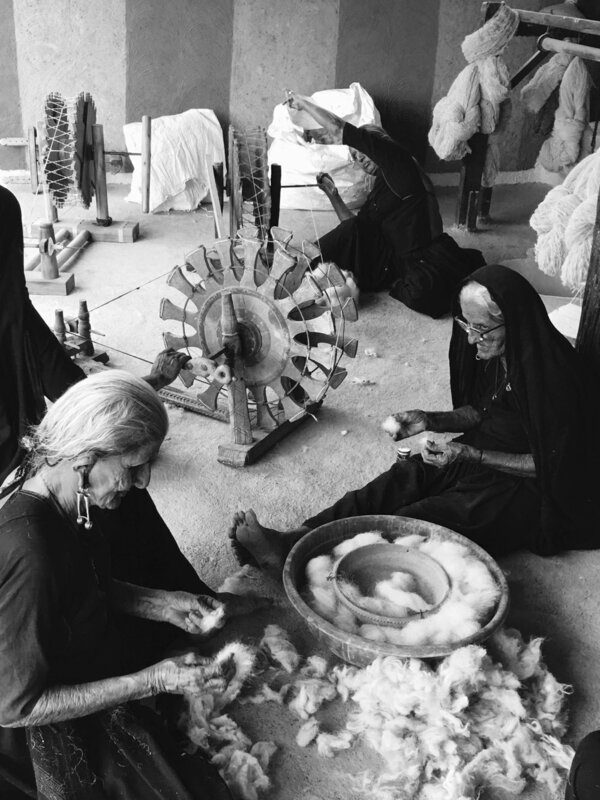 Shamjibai has encouraged a group of these Rabari women to continue their traditional hand spinning for his weavers.